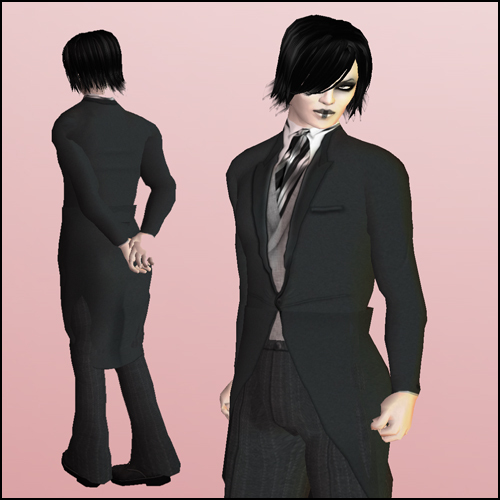 Yesterday I searched the grid for a good tuxedo to wear for a rockabilly prom. At the last minute I decided to wear something green instead! However, this tuxedo from Rebel Hope is too nice not to write about. It reminds me of Eton. With this new boy-Ach shape (from Lemon, and you should see the bottom on this guy :D ), I think I look like a public school boy turned vampire. Let me extol the virtues of Lemon! This shape is so lovely that it displaced my usual boy Ach shape entirely, partly because the skull looks fabulous without hair, and the face looks excellent in makeup. My TheAbyss skin looks okay on it too, although I prefer that skin with a larger jawline. ehehe, thank you, miss sakura! isn't he a looker? yeah, lemon also has girl shapes -- i should try those out sometime too.